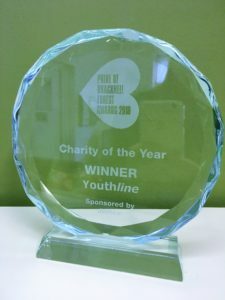 Youthline wins ‘Charity of the Year 2019’ at the Pride of Bracknell Forest awards held on Friday, 15th March at Royal Military Academy in Sandhurst. We are very proud to have been nominated and to win this award. Thank you to all those that voted for us. We would also like to thank all our volunteer counsellors, volunteers, staff and Trustees. The evening was attended by Collette Reynolds, Practice Manager and Stephanie Fitzwilliams, Volunteer Counsellor representing Youthline. 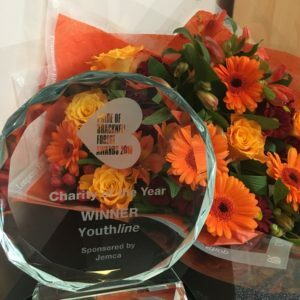 They were honored to attend and collect the award on behalf of Youthline. Thank you to ‘Jemca Toyota Bracknell’ for sponsoring the Charity of the Year award.